In the West Baltimore neighborhood where detective Sean Suiter was shot and killed four days ago, police cars were everywhere today. Officers in tactical gear were banging on doors and residents were prohibited from entering their neighborhood without showing identification. “They’ve been to my house three times asking, ‘Did you hear anything? 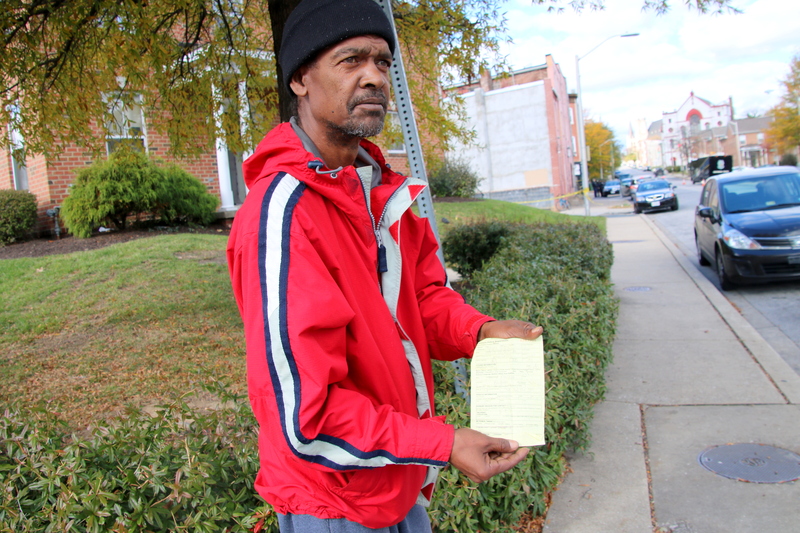 Do you know anything,’” said Edward Stanley, showing a yellow slip of paper that he is required to present to police in order to get into his partner’s Franklin Street rowhouse. “The other murders – like that little girl killed two months ago right up the block – you didn’t see anything like this,” Stanley fumed. “That tells me they care more about them than us,” said the 54-year-old, referring to the police, as he walked his Shih Tzu, Yip. Two women walking down Franklin Street to get to their cars, parked blocks away because of the lockdown, complained that they had been harassed by officers. “They know I live here. They’ve seen me come and go. But this one had to pat me down. He [the officer] went like this to my jacket, grabbing it,” said Shelly, 25, who asked that her last name not be used. Police initially said they needed to cordon off the area to try to capture the shooter. Police have said Suiter was in the 900 block of Bennett Place, investigating a previous homicide, when he was shot on Wednesday. So far, no arrests have been announced in the case. This morning, homicide detective Mike Newton told The Brew that the lockdown was necessary to collect evidence. “It’s basically still an active crime scene,” said Newton, who carried a stack of informational fliers advertising a $215,000 reward for information leading to an arrest. 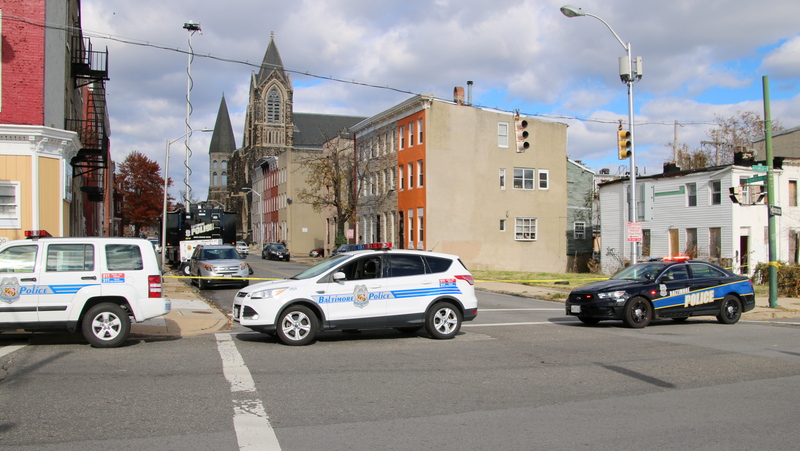 Smith’s announcement came on the heels of intensifying complaints about the lockdown – from Harlem Park residents, from an online campaign dubbed #freewestbaltimore and today from the American Civil Liberties Union of Maryland. The constant buzz of helicopters circling overhead and the gauntlet of neighborhood checkpoints, critics said, led the neighborhood to feel it was under seige. “BPD has some Apartheid era pass checking going on restricting pple travel,” wrote @BMORETRIALBOARD. Civil Liberties lawyers today joined the chorus of concern over isolating a neighborhood and restricting the movements of residents in the name of searching for a cop killer. “We are also troubled by reports that some persons entering or leaving the area have been subject to pat down searches, and that non-residents have been barred from entering the area,” said senior staff attorney David Rocah in a statement today. “While the search for a killer is, of course, a high priority for the police, the limits on lawful police behavior do not disappear even when engaged in that pursuit,” Rocah added. He said that at least one federal appellate court has said that a similar police cordon and checkpoint system was unconstitutional. 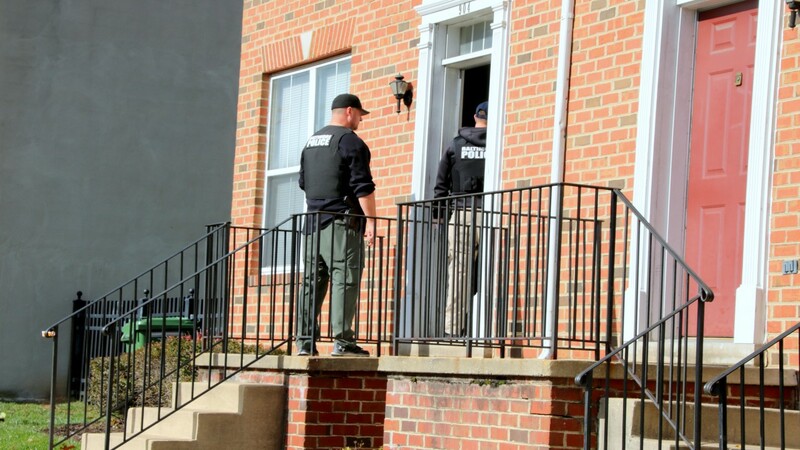 “The residents of Baltimore and, in particular, the residents of the affected community deserve a clear explanation from the city as to why this unprecedented action has been taken, what rules are being enforced, and why it is lawful,” Rocah wrote.